Despite a panicky music industry throwing the baby out with the bathwater in its headlong rush to embrace emerging digital formats, it was the small independent labels that kept vinyl alive and kicking throughout the late 1990s and early 2000s, mostly in the dance music, R&B and hip-hop genres. Vinyl was kept on life-support for the longest in the pubs and clubs, perhaps because of the format on which the nightlife industry operated – the famed Technics SL-1200 direct-drive turntables originally manufactured from October 1972 until 2010 and much loved by DJs because of their ‘bulletproof’ construction and instant stop/start high torque motor. Over the last decade vinyl has made a strong comeback with home audiences. Ironically, CD playing decks which emulate a turntable (CDJs) have become omnipresent alongside laptop-operated mixing software in the DJ booths and vinyl has been phased out in the clubs. These home audiences have led to the huge growth in record sales over the last three to four years. With high street heavyweights such as Sainsbury’s and Tesco even stocking vinyl – and instantly reducing its cool factor – there seems to be an air of permanence to what was considered by many to be temporary. With this rise in the format’s popularity the surrounding industry has been playing catch-up, the official vinyl LP album and singles chart (officialcharts.com) being launched in 2015, as new figures revealed the vinyl resurgence continued strongly in that year. 2014 witnessed vinyl LP sales reaching a 20-year high in the UK at 1.29 million, following seven years of growth. The surge in popularity of the physical format does seem to be translating to the equipment and devices on which it is played. Jamie Harriss of Bartlett’s, a North London audio specialist, says: “With the renaissance of vinyl, consumer interest in turntables has increased two-fold. The superior sound quality and tactile experience of vinyl playback offers an antidote to our increasingly digitised world. 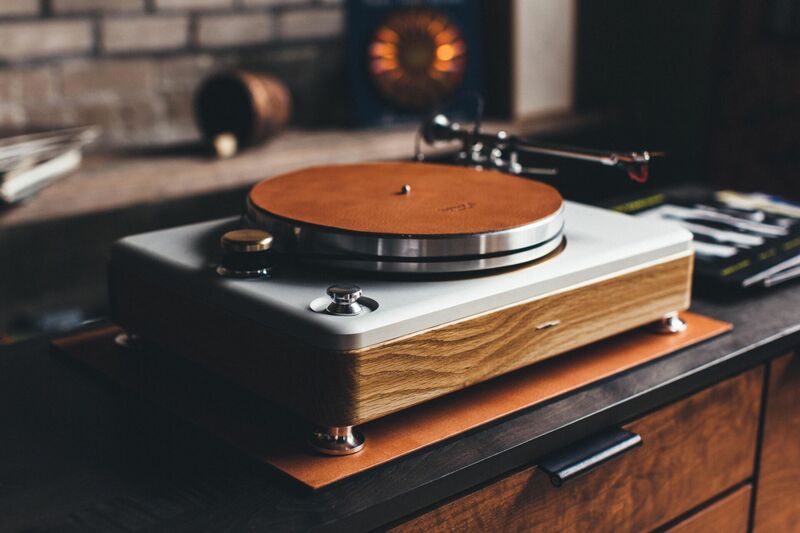 Modern turntables now come with all the mod-cons and connectivity the younger generations expect, but many still want to obtain that ‘fully analogue’ experience. Mr Bannister of Ruark added: “The fact that turntable manufacturers have incorporated modern technology, such as Bluetooth, has definitely helped attract a new generation of music lovers to vinyl. Despite this, those with a true passion, whether old or new, are blessed with modern technology, fantastic sound, features and conveniences. That there are major moves being made by some big names in the industry perhaps backs up the general buzz that the vinyl resurrection is showing no signs of dying down. The business benefits of a fully operational record label with its own pressing plant also means they can offer vinyl to customers to buy literally hot off the press – which has not been done before. To read more of this exclusive feature, pick up the latest issue of CALIBRE magazine – OUT NOW!